With so many diﬀerent play activities, you’ll always ﬁnd plenty to do at Mead Open Farm. And all our indoor activities make it a great value day out with the kids, whatever the weather! 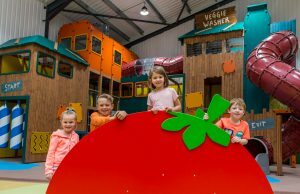 Based within Shaggy’s Huge PlayWorld, NEW for 2018, climb high into the veggie tower, zoom down slides, hear the broccoli sing and play in the Giant Pumpkin! Please note that children must have their arms and legs covered to ride on the slides in Shaggy’s PlayWorld, and socks must be worn at all times while playing in the PlayWorld. Named after the Farm’s cuddly mascot, Shaggy’s indoor PlayWorld is huge – totalling over 13,000 sq feet! And with the NEW Magical Veggie Wood too, it’s now even bigger. 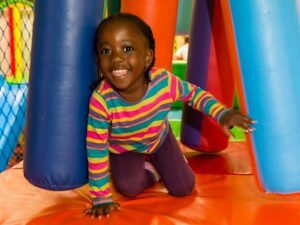 Located in the heart of the action, Shaggy’s PlayWorld provides over 300 seats, a Cafe serving meals, snacks and drinks and loads of fabulous indoor play equipment. 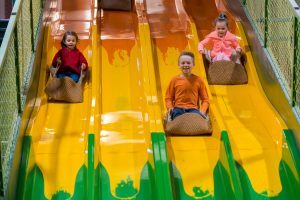 The kids will have a ball as they zoom down the 65ft astra slides, brave giant drop slides, clamber over shiver chicanes, fire ball cannons and scramble zigzag net climbers. There’s just so much to do! Please note that children must have their arms and legs covered to ride on the slides in Shaggy’s PlayWorld, and socks must be worn at all times while playing in the PlayWorld. Loads of safe, gentle fun for the Under 5’s! Located in Shaggy’s PlayWorld, it’s a designated area for smaller children designed with them in mind. 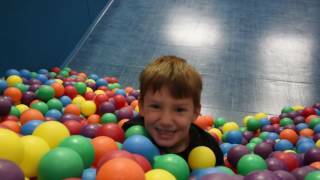 Discover bags of soft play, a ball pit and slides. Your little ones can run wild while the grown-ups enjoy a tea or coffee from The Grain Store Kitchen. We’ve designed the Farm to be fun and interactive in all weathers, so many of our animal activities take place in our four large animal barns – out of the rain and wind! 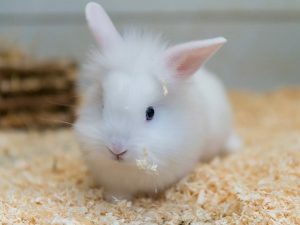 Whatever the weather, you can always come and stroke our rabbits at Bunny Hop, hand-feed and bottle-feed our lambs, marvel at the antics of our pygmy goats and groom our lovely little ponies. So don’t let the weather put you off – come and get some fresh air and fun down at the Farm! Whatever age they are, children will have a fantastic time in Shaggy’s PlayWorld, with its massive playframe packed with fun things to do for older kids, while Mini Moo’s Imagination Village and soft play area for Under 5’s provides fun and stimulation for toddlers and pre-schoolers.